Here it is — the Chevrolet Trailblazer — as a Colorado global pickup-based SUV named after the SUV killed by GM in 2009. Although the seven-seater Trailblazer may be similarly sized to the GMC Terrain that's now offered in the U.S., the Trailblazer rides on a body-on-frame platform — you know, like a "real" SUV. As a result, this SUV will likely be more rugged and be better suited for off-road duty. Right now it looks like it'll be available in Australia and other select global markets. GM hasn't yet revealed whether it's coming to the U.S. Jeez. What kind of world is it when we can't even get the soccer mom-mobiles that are actually utilitarian? Bring us a real SUV, GM! 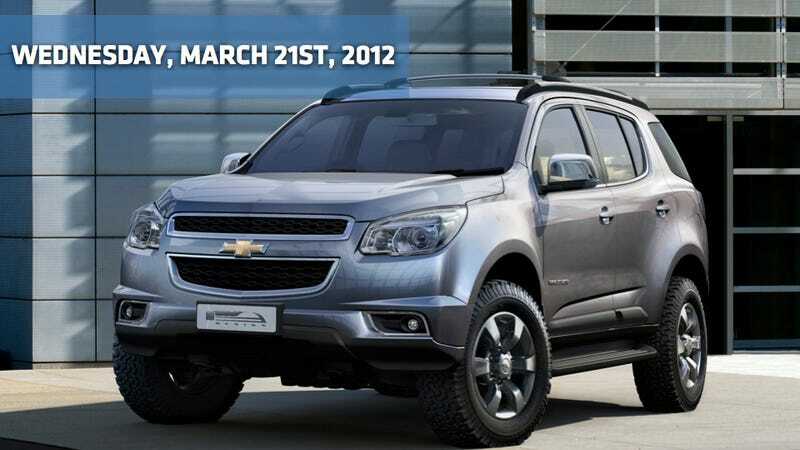 The Chevrolet Trailblazer is back! Left Lane News tells us this morning that Italy's Biemme Special Cars, a custom shop specializes in converting luxury sedans into hearses, has a new, expensive way to bring out your dead. The coachbuilder's new hearse of all hearses is called the Phantom B12 — and is based on the Rolls Royce Phantom. The car's already-long wheelbase has been stretched to a ginormous length of about 23 feet and we've got to believe that custom framework's gonna be pricey. This might take the already expensive Phantom — $447,000 starting price — to the level of the most expensive hearse in the world. Expect to see the new extended-length hauler of the dead to drop at the Bologna Motor Show. South Korea's Hyundai Motor plans to launch a revamped version of its mid-sized Sonata sedan in 2014, chief executive Kim Choon-ho told Reuters earlier today. The latest version of the sedan was launched in September 2009 in South Korea and early 2010 in the United States. Sonata, which competes with Toyota Motor Corp.'s Camry, is Hyundai's top-selling model in the United States and helped the South Korean automaker achieve record sales and market share there last year. According to Car & Driver, the Honda Crosstour, once a vehicle we hoped would be more in line with its original name — Honda Accord Crosstour — is set to get a refresh at next month's New York Auto Show. Expect it to be the first vehicle to show off the automaker's new design and styling direction. Let's see if it meets with the critical acclaim the last styling change didn't receive. An Autocar report this morning adds more fuel to the fiery rumors of an Evoque-style Jaguar crossover. The magazine claims that if it's signed off for production, it could go on sale around 2016 to crown a radical overhaul of its complete model range. Luckily, they also claim that this new crossover will be preceded by production versions of the C-X16 and C-X75 sports cars and Jaguar's new BMW 3 series-killer compact saloon, tentatively due in 2015.